Almost everything we know and everything we do has some electronic or digital element to it. The convenience of electronic communication cannot be overstated; virtually every function in life benefits from the compilation of information and data in electronic form. But the convenience factor of our digital age is balanced by the danger we all face from people who can access information illegally through the use of technological knowledge. Just as everything seems to be available electronically for the use of consumers, everything is also available electronically for the use of those who legally have no right to that material or information. Which brings us to the topic of cyber-security. Based on the occurrences of stolen personal financial information from websites over the past decade, it seems as if there is no true perfect protection against someone with nefarious purposes in mind hacking personal information which exists electronically. That does not mean investors do not expect their personal financial information to be protected by their financial advisors and providers. What it means is that they want assurances that all that can be done to protect investable assets is being done by the firm managing those assets. Spectrem’s new whitepaper on cyber-security explains the complicated relationship investors have with the concept of cyber-security. Investors with a net worth over $100,000 (not including primary residence) were asked to explain how they feel about the security of their investable assets. Perhaps investors have a special protection against computer hacking. Only 6 percent of respondents said they had been the victim of hacking to the point that their personal financial information was acquired. That may be just those investors who have had their personal financial information used by outside sources rather than those who have had an account with a credit card company or retailor which has had its accounts hacked. Considering the number of times credit card companies and retailors have been struck by a computer hack, it is surprising that investors do not report a high level of concern over the matter. 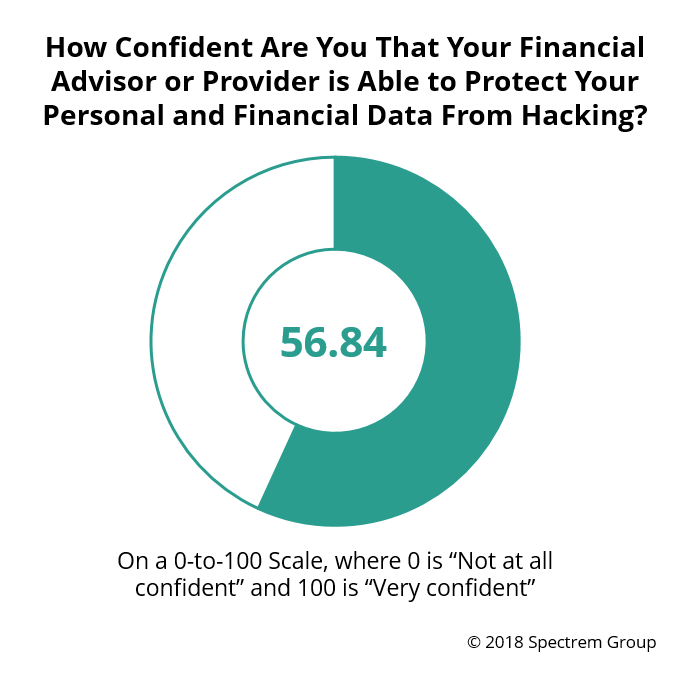 On a 0-to-100 scale, investors overall put their level of concern at 56.40, which displays neither confidence nor a lack of confidence in the safety of their personal financial information. The level of confidence over the safety of personal financial information is no higher when investors are asked to consider the security of their information held by their financial provider or advisor (56.84). Investors are slightly less likely to believe they would know if their personal information had been compromised, which indicates a lack of attention to account transactions and daily balances, attention that could signal or even prevent a hacking incident. Because financial advisors handle other people’s money, they are held to a standard that may not be attainable, and even the investors know that. Asked a simple yes-no question “Do you believe it is possible to keep your personal information completely safe from hacking while using online services for banking or making purchases?’, 76 percent of investors said “no”. That means most investors understand the difficulty in keeping financial information safe when it is available online, no matter how many passwords or authentications are applied to the safety of the information. That being said, 65 percent of investors said they would consider moving their accounts to another provider or advisor if their current accounts were hacked. That doesn’t seem fair, but that is the expectation and the reaction investors have regarding cyber-security. You cannot promise investors that their information will forever be safe from hacking. Can’t be done. But you can provide investors with information on your firm’s cybersecurity processes, including a cybersecurity insurance plan. It is also possible to discuss the “what if” topic; what if an account is hacked, what will the advisor do to protect the account information? While such precautions may make some investors feel nervous about the eventuality of a computer hack against their accounts, the information should make investors feel that every step is being taken to ensure the safety of their accounts and their investable assets.